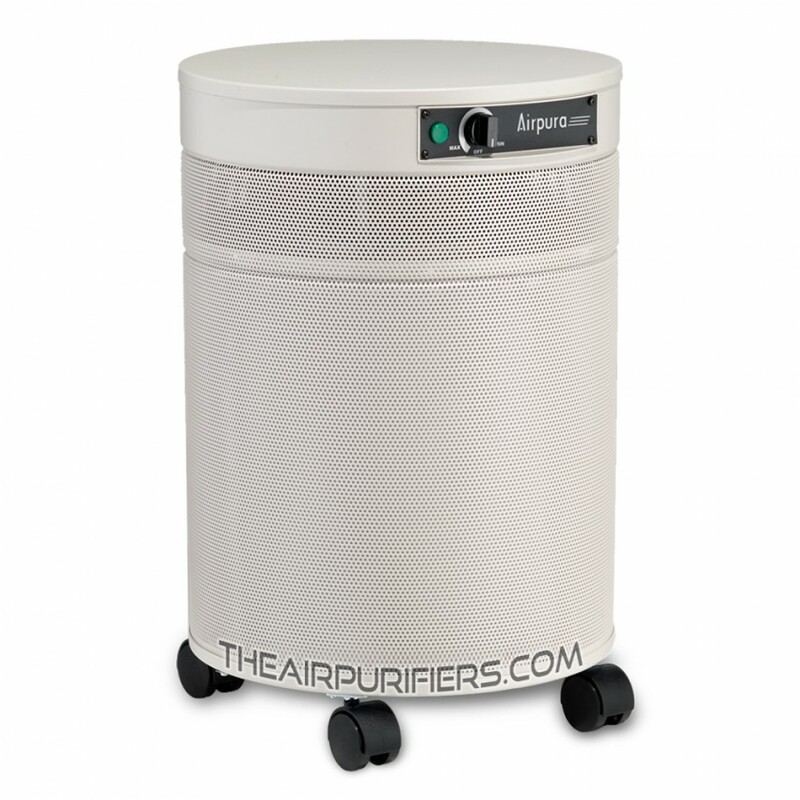 AirPura T600DLX employs the AirPura oversize filter canister filled with the AirPura T600DLX specialty adsorbent. Along with the AirPura TarBarrier pre filter it enables the AirPura T600DLX to achieve peak performance in Heavy Duty Tobacco smoke removal and deliver the ultimate protection from primary and secondhand smoke. The AirPura T600DLX centerpiece is an oversize filter canister with AirPura T600DLX specially enhanced adsorbent for Heavy Duty Tobacco smoke removal. The AirPura T600DLX tar-barrier pre filter protects the air filtration system from sticky tars in cigar and cigarette smoke. AirPura T600DLX is powered by a robust, energy efficient and quiet the one-piece motor/fan. The AirPura T600DLX variable speed control helps easily find the optimal air flow in all operating conditions. The impressive air flow of 560 CFM makes the AirPura T600DLX suitable for cleaning air in large areas up to 2000 sq. ft.
AirPura T600DLX features non off-gassing and durable the all metal housing with appliance finish powder coating. AirPura T600DLX is protected by a peace-of-mind 5/10 Year AirPura limited manufacturer's warranty. AirPura T600DLX is Ozone and Toxic off-gassing Free air purifier. AirPura T600DLX ships Free of charge by Ground service in Canada and the continental USA. There are No US Sales Tax and No Border Crossing fees on AirPura T600DLX purchases. 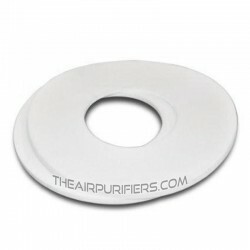 AirPura T600DLX is a subject to a 30-Day Money Back Satisfaction guarantee Return policy. AirPura T600DLX - When to Use? AirPura T600DLX air purifier packs an impressive air cleaning power and capacity, which allows the T600DLX to achieve a Superior rate of removal of all regular and most importantly hard-to-remove dangerous carcinogenic chemicals in a cigarette (tobacco) smoke and provide a superior level of protection from primary and a secondhand smoke in large open areas or multiple rooms up to 2000 sq. ft.
all other locations where the Superior rate of removal of tobacco and cigarette smoke is a top priority. 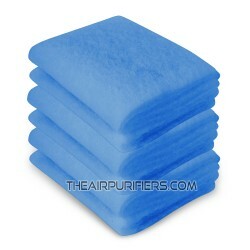 The AirPura T600DLX air filtration system comprises the following filters. 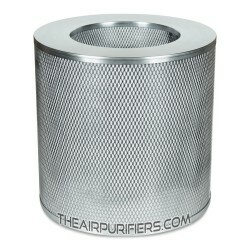 Oversize 3-inch Deep Filter Canister with Specialty Adsorbent. 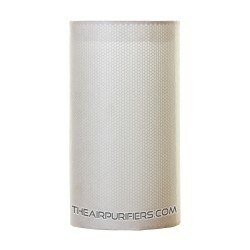 The oversize 3" deep filter canister is the core of the AirPura T600DLX air filtration system. It contains an impressive amount (26 lbs.) of carbon based adsorbent enhanced with Special additives. Such a massive amount of adsorbent combined with an extended dwelling time in a 3-inch deep carbon bed renders the unparalleled level of adsorption capacity of AirPura T600DLX in removal of all regular and specific carcinogenic chemicals in high concentrations that are present in heavy tobacco, cigar and cigarette smoke. To achieve an adequate filtration efficiency in removal of fine ash and dust particles in tobacco smoke, the AirPura T600DLX is equipped with a HEPA-Barrier Post filter. The HEPA-Barrier post filter is a 98% efficiency HEPA-type filter, which is used in the T600DLX instead of the True HEPA filter in many other AirPura models and plays an important role in trapping sub-micron solid airborne contaminants and fine ash to ensure the comprehensive air cleaning result. 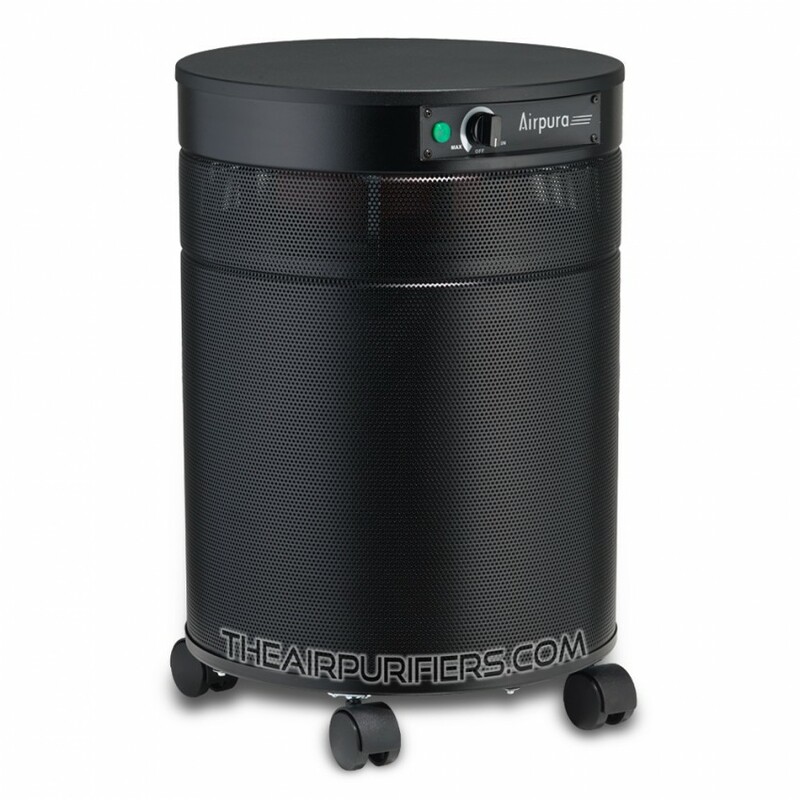 AirPura T600DLX employs the special Tar-Barrier Pre filter instead of a standard Polyester based one in most other AirPura air purifier models. The Tar-Barrier pre filter has a specific ability of effectively trapping heavy tars in cigarette / tobacco smoke. It plays an important role in protecting the air filtration system of AirPura T600DLX air purifier from faster contamination by sticky tars in heavy tobacco and cigarette smoke. AirPura T600DLX employs the same powerful, yet energy efficient Motor/Fan assembly with a variable speed control rated at 560 CFM. The factory-balanced one-piece Motor/Fan assembly ensures a vibration and noise-free operation. The variable speed control gives the AirPura T600DLX users more flexibility in managing the air cleaning performance in all situations. The motor and electric components placed in the separate chamber at the top of the unit help eliminate the contact with already filtered air and prevent its possible re-contamination. The AirPura T600DLX is also available with optional 220-240 Volts, 50 Hz motor and power cord at Extra cost. AirPura T600DLX features the unified throughout the AirPura lineup the all metal durable and impact resistant housing. The appliance quality baked-on powder coating is scratch, scuff and stain resistant. It help to retain the attractive appearance for many years. The baked-on powder coat is totally inert and produces no toxic off-gassing. The 360° Clean air outlet at the top deck of the unit ensures an even distribution of purified air throughout the room. The Clean air outlet in the upper deck of the unit is located away from dust and dirt on the floor. The Four Wheel Casters on the bottom panel ensure a high level of mobility and maneuverability within the entire cleaning area. As most AirPura air purifier models, the AirPura T600DLX comes with the most comprehensive limited manufacturer's warranty. It gives the AirPura T600DLX air purifier owners a peace of mind.